To Tony Corden and all the friends who are part of the family of El Sueño Existe. For almost forty years, since the military coup in Chile and the brutal murder of OUR dream of building a society based on social justice, I have had the opportunity to travel all over the world and to find Victor’s songs being sung and, above all, the values inherent in them being shared and celebrated by so many and such diverse groups of people that I could, in spite of everything, in the darkest days of the dictatorship, hold on to hope for the future. 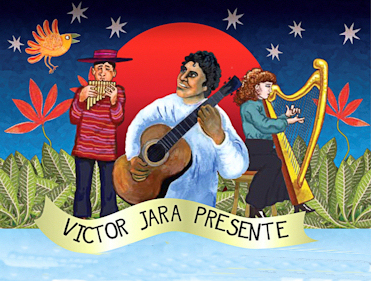 Many years later, at a time when the people of Chile no longer needed international solidarity, I heard of your new cultural festival in a beautiful place in far off Wales which maintained the memory of Victor and all he stood for at the heart of it. Never actually being able to be present, from afar I saw how it grew and developed over the years, fulfilling an ever greater need of people to come together to affirm their values and their cultural identity through song, poetry dance and music. Earlier this year I was amazed that the Festival El Sueño Existe was capable of being present in London and it was very moving for me to see the vitality and commitment of the artists taking part. I send my very best wishes to all of you, confident that you will not only dream, but work together for a better world. The new generations deserve that inheritance. Un abrazo fraternal a cada uno de Uds.